Gold Label Black Pond Sealant is ideal for repairing or bonding pond liners and can also be used to repair cracks in concrete ponds. 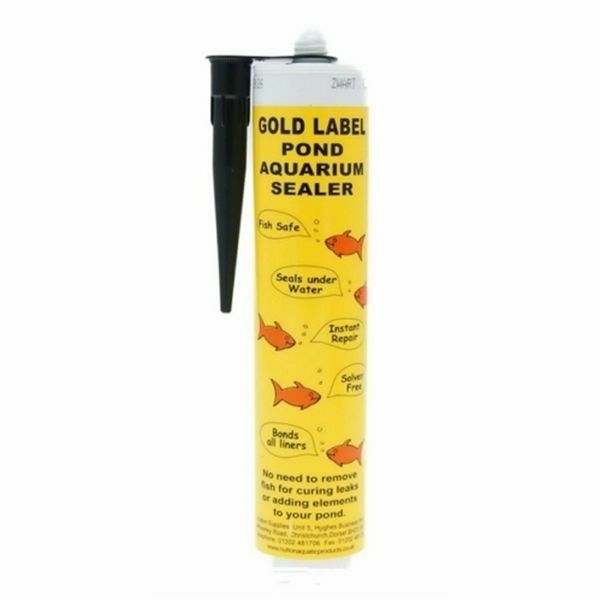 The sealant can be applied using a standard sealant gun (not supplied) and is completely harmless to fish and pond life. Black, one part, high modulas, polyether sealant. Gold Label Pond Sealant will bond steel, glass, wood, plastic to itself or most other materials. It will bond pond liners to concrete or stone to make a leak proof waterfall or stream. Suitable for patching pond liners or sticking folds. Gold Label will cure under water, it never goes hard and always retains a slight elasticity. Solvent free and fish safe. 290ml tube requires standard sealant gun. For bonding where there is movement (expansion & contraction) of different substrates, leave a minimum 5mm thickness of bead between surfaces. If there is livestock near the sealer, protect from ingestion while curing. Full cure 24 hours. Initial tack 2-3 Hours. Can be painted over up to 4 hours. For Clear Gold Label, cure for 36 hours.